For the unrelated roll-film format produced from 1898 to 1929, see 110 film (roll format). 110 is a cartridge-based film format used in still photography. It was introduced by Kodak in 1972. 110 is essentially a miniaturised version of Kodak's earlier 126 film format. Each frame is 13 mm × 17 mm (0.51 in × 0.67 in), with one registration hole. There were 24 frames per cartridge that occasionally enabled the user to capture an extra image due to production variations. The film is fully housed in a plastic cartridge, which also registers the image when the film is advanced. There is a continuous backing paper, and the frame number and film type are visible through a window at the rear of the cartridge. The film does not need to be rewound and is very simple to load and unload. It is pre-exposed with frame lines and numbers, a feature intended to make it easier and more efficient for photofinishers to print. Unlike later competing formats, such as disc and APS film, processed 110 negatives are returned in strips, without the original cartridge. Comparison of Disc, 100, and 135 image size. The 110 cartridge was introduced by Kodak in 1972 with Kodak Pocket Instamatic cameras with Kodachrome-X, Ektachrome-X, Kodacolor II, and Verichrome Pan film. The new pocket-sized cameras became immediately popular, and soon displaced competing subminiature cameras, such as the Minolta 16 series, from the market. The 110 film width is 16 mm. A four frame strip measures 111 mm. The 16 mm film width allowed Kodachrome film in 110 size to be processed on the existing processing machines that processed movie films in the Standard 8 mm film and 16 mm film sizes. Estes Industries has long marketed several model rockets, the most notable being the Astrocam, with a simple 110 camera in the nose; the shutter is triggered when the nose cone separates from the rocket body. Closeup of part of a 110 negative seen through a film scanner. Although the format is most closely associated with cheaply produced, low-cost cameras, Canon, Minolta, Minox, Pentax, Rollei, Voigtländer, and others, as well as Kodak, offered sophisticated, expensive 110 cameras, with excellent multi-element focusing lenses and precise, electronically controlled exposure systems. 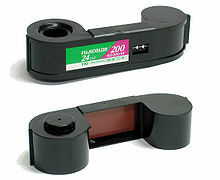 Such cameras are capable of making high-quality images on 110 film. Some of these cameras are quite small and still hold appeal to subminiature-photography enthusiasts. The small negative size of 110 film makes it difficult to enlarge successfully. For these reasons, the 110 format is associated with prints that are often rather grainy and unsharp. This has led to the misconception that the cartridge itself is incapable of holding film flat enough for making high-quality negatives. The 110 cartridge, as specified by Kodak, has a plastic tab on one end. Camera designers had the option of using this tab to sense film speed, enabling sophisticated cameras to switch between high- and low-speed film. A short tab indicated high-speed film, and a long tab indicated low-speed film. Kodak left it to the film manufacturer to decide which film speeds were high or low. Only a few cameras took advantage of this feature: Rollei A110, Canon 110 ED 20, Minolta 110 Zoom SLR Mark I/II, Minox 110S, Voigtlander Vitoret 110 EL, Pentax Auto 110. The last 110 film that Kodak produced was ISO 400 speed packed in a cartridge that senses as "low" speed. As shown in the photograph to the right, these cartridges can be modified by hand so that they signal the proper speed to the camera. Three mini slides from 110 film, along with the box they came in from the lab, the plastic slide holder that was inside the box, a standard-format slide adapter, and a battery-powered pocket slide viewer for the mini slides. Although the format is commonly associated with print film, Kodak also produced Kodachrome 64 slide film in 110 cartridges until 1982. In 2012 Lomography re-introduced slide film for 110 with their Peacock 200 ASA model. However, since not all 110 cameras have a settable ASA dial (low or high, depending on presence of a notch in the cassette), a ND filter has to be used over the lens or the exposure compensation dial has to be used where available. Otherwise, over-exposure by a factor of x2 will result, leading to over-exposed images. Kodak's Verichrome Pan was the only 110 black and white film produced until 2012, when Lomography manufactured their new Black and White Orca film at 100 ISO speed. This speed is supported by most 110 cameras. As of 2017, this film is still in production. ^ Magazines, Hearst (1 June 1972). "Popular Mechanics". Hearst Magazines. Retrieved 18 May 2018 – via Google Books. ^ "Sayonara 110 – Fujifilm discontinues 110 colour negative film". Archived from the original on 2009-10-07. Retrieved 2009-10-05. ^ a b "110 Film – Lomography Shop". Archived from the original on 2013-07-03. Retrieved 2013-06-30. ^ "110 Film". Shop.lomography.com. Retrieved 18 May 2018. ^ "110 Pocket Instamatic film in the Frugal Photographer catalog". Frugalphotographer.store. Retrieved 18 May 2018. ^ a b Marcus, Ted R., APS, 110, "Disc," and Formats du Jour, Ted Marcus' Virtual Light Table. Article copyright date 2006, retrieved 2006-11-09. ^ Marcus, Ted R., Europe Through the Front Door, Ted Marcus' Virtual Light Table. Article copyright date 2004, retrieved 2006-11-09. ^ "Lomography – The Home Of Creative Analogue Photography & Cameras". Archived from the original on 2013-07-03. Retrieved 2013-06-30. 110 Cameras at Sub Club, a site on subminiature photography. 110 Processing and Films at M.S. Hobbies, a site on subminiature photography. 110 Processing and Films at a site on subminiature photography.